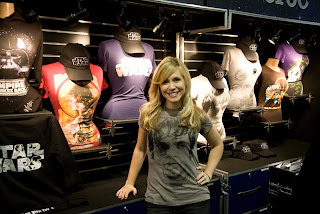 Ashley Eckstein, the voice of Ahsoka Tano of The Clone Wars, has become a voice for female sci-fi fans with her company, Her Universe. It's about more than just merchandising. I got the chance to talk with Ashley at Comic-Con. Read about Her Universe and Ashley's goal in my post at Pink Raygun. That is so cool! Great Job Amy! is full of interesting information which is the great sign of a great blogger. If someone want to read more about that GAMSAT Practice Test I think this is the right place for you!